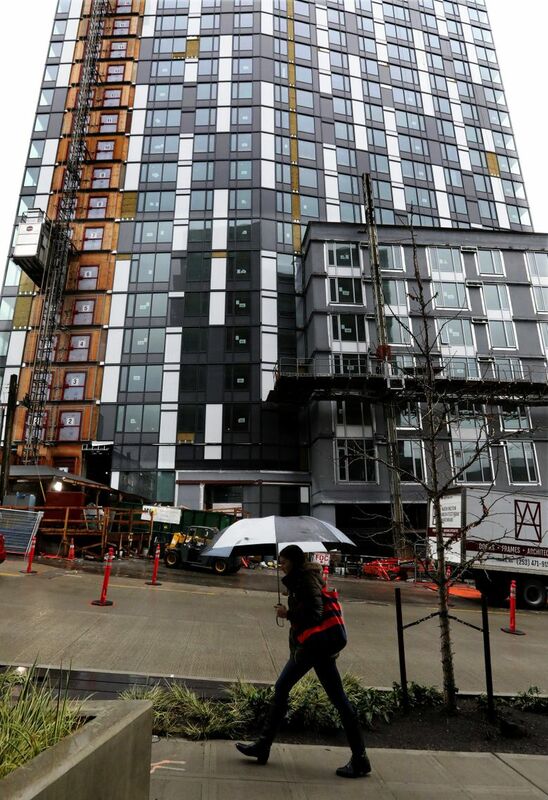 The Seattle City Council will decide on changes to parking rules that would allow more housing to be built without off-street parking, and give tenants the option of not renting a parking space with their apartment. The Seattle City Council plans to vote Monday on a wide-ranging set of changes that would allow more housing to be built throughout the city without off-street parking and let existing building owners rent their unused parking spots more widely. The legislation, years in the making, intends to make it cheaper to build housing — by no longer requiring space for parking — while also continuing Seattle’s slow shift away from a car-centric city. • Building owners could rent out excess parking, in both commercial and residential buildings, to people who do not live or work in the building. • Apartment buildings with 10 or more units would be required to “unbundle” the costs of renting a parking space from the cost of renting an apartment. Landlords would have to charge separately for the parking space, giving tenants the option to forgo parking and, in theory, pay less for housing. • More areas of the city would be classified as being near “frequent transit service,” meaning developers can build housing there without providing off-street parking. The changes would accelerate a long-term trend of building housing without building parking in the city. In 2004, each new apartment came with an average of 1.5 parking spots. Last year, new apartments averaged just 0.6 parking spots. Supporters hope that by requiring less parking — which costs money to build and maintain — developers can build more and less-expensive housing. The proposal aims both to better use the off-street parking that currently lies beneath apartment and office buildings and to build less off-street parking in the future. But neighborhood groups opposed to the proposal argue that people aren’t ditching their cars nearly as fast as the city believes, and as Seattle grows, off-street parking will still be necessary. The push for the changes began under former Mayor Ed Murray, and the legislation was introduced last fall by former Mayor Tim Burgess. A spokeswoman for Mayor Jenny Durkan said she looks forward to reviewing the final council proposal. The proposal has broad support on the City Council and is expected to pass. The city points to a study from King County Metro showing that about one-third of residential off-street parking is unused. Those empty patches of asphalt and concrete are not cheap. Off-street parking generally costs between $30,000 and $50,000 per stall to build. Current law does not permit residential landlords to offer unused spaces to anyone who doesn’t live in the building. Under the proposal, building owners could determine their own rules and prices for renting the spaces. The only limit would be no more than 145 spaces per building could be available to the public. And more spaces could be available to rent out if people who don’t have cars are given the option to rent an apartment but without a parking spot, as the proposal would require. The theory: People living near transit are less likely to own cars, and housing in those neighborhoods should adjust to that. Insisting that construction include parking, neighborhood groups have challenged and stalled new developments around the city by pointing out that buses often do not arrive as frequently as the law requires. The new proposal would ease the requirement for “frequent transit service” by changing the definition from a bus arriving every 15 minutes through most of the day to every 18 minutes. It also would base the definition on scheduled arrival times, not actual times.